The Qatar Airways plane from Doha to Kathmandu was full, carrying aid workers and rescue specialists from around the world. But the bulk of the passengers on Tuesday’s flight were Nepalese migrants, temporarily returning home to do what they could for their families after the devastating 25 April earthquake. Most were coming from Gulf states – like Kemras Dasel, who has worked as a storekeeper for a company in Riyadh, Saudi Arabia for the past seven years. His family abandoned their home in Kathmandu after the walls cracked in the violence of Saturday’s 7.8-magnitude quake. Two of Dasel’s relatives are dead, one a six-year-old child. They are among more than 5,000 people reported dead so far. His family has been living under tarpaulin in their old neighborhood for the past three days, fearful of the aftershocks. “Everyone is in so much problems. I want to do what I can to help,” he told IRIN. 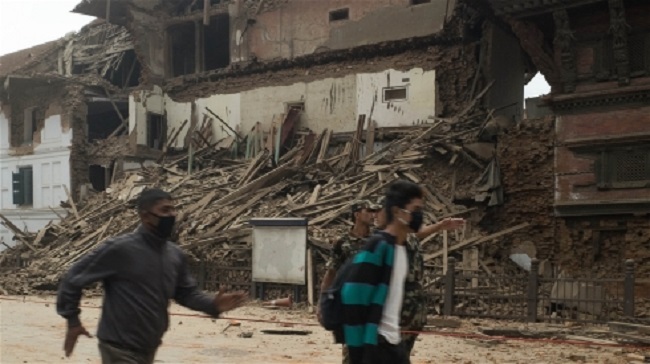 The International Trade Union Confederation this week called on Gulf states to allow Nepalese migrant workers to break the terms of their restrictive sponsorship agreements to return home and help their country in the wake of the earthquake. Amrit Shrestha, who works as a bakery driver in Qatar, has been given one month’s leave to sort out his family. His relatives are all safe, but his home in Kathmandu was damaged. “I will see what I can do,” he said simply. Remittances from men like Dasel and Shrestha working abroad amounted to $5.9 billion in 2014, according to the World Bank, roughly 29 percent of Nepal’s gross domestic product – money their families will rely on to rebuild. Some two million Nepalese migrants work abroad, the vast majority in India, Saudi Arabia, Qatar and the United Arab Emirates. Also on flight QR 652 was Nikesh Prajapti, a young business analyst based in Idaho, United States, who was originally coming home on vacation to be with his wife and daughter – but is now on something of a rescue mission. As the plane flew circuits for two hours above Kathmandu’s congested airport, he worried about the security of his family, living 25km east of the city, who were now camping in a field outside their home. “I’ve already heard about stealing and looting from houses. I imagine it could get worse before it gets better,” he said. If his concerns materialize, he said, he will take his immediate family and parents back to the US. But right now, he is looking to do what he can to help. “I was speaking to some doctors [on the flight] and they are making plans to do some humanitarian work. I want to join them, to help my community,” he said. IRIN last saw Prajapti standing on the conveyor belt in a chaotic baggage reclaim hall at Tribhuvan International Airport, shouting out the names he could identify on the pieces of luggage, trying to ease the logjam for a frustrated, milling crowd.